Unisex modern steampunk Gothic cyber watch by Hi Tek Design London ALEXANDER model name VOLCANO. This watch is from Hi Tek Vintage collection from the 90’s. This watch is a very unique design. The glass on the face has a magnifying effect. The face is black, it has hi tek graphics at the positions of 12, 3, 6 and 9 o’clock. The second’s dial is the hi tek logo. The measurement of the case is 45 mm / 1 6/8″ width and 50 mm/ 2″ in length and 20 mm / almost 7/8 ” in thickness. Alloy case, stainless steel back. Cannot be stressed how fantastic this watch looks on. This watch can be worn by men or women, it has the ability to look just as good on both sexes. 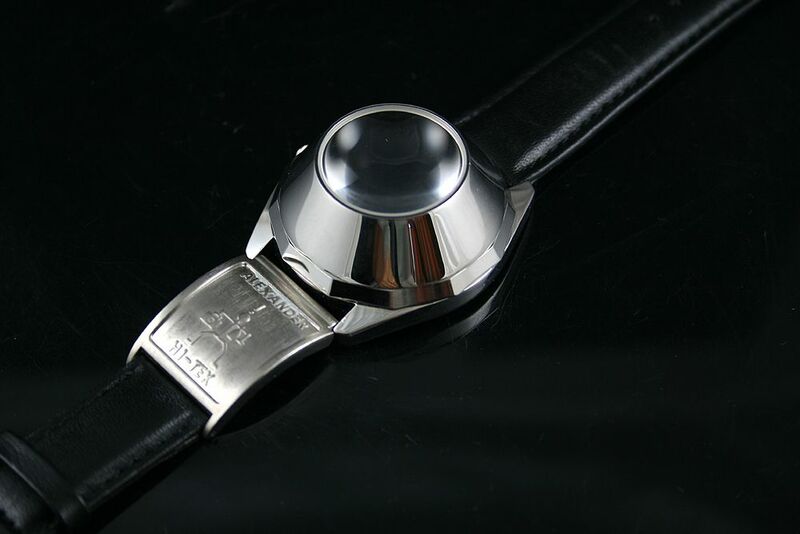 Watch comes in Hi Tek stainless steel logo case as shown in photo. The pictures show the rest.